Are you killing your electrical utility? A woman installs a solar panels on the roof of her house in rural Bhutan. You may be doing it without knowing. Or you may want to, if you knew how. We, the consumers, are going to be in control now. Technology is changing the world, and new batteries and energy-efficient lights are already here. With solar power we can generate our own electricity, and with new batteries we can store it and even sell it to our neighbors. We also need less electricity; with energy-efficient lighting and appliances, our electricity needs are reducing every year. So who needs an electricity company? Their long-held monopolies are soon coming to an end. Remember the phone companies? Remember when we had to wait for months, even years to get a new connection, and pay about $3 per minute for a local call? Now we have more mobile phones than we need, some calls are free, and many of us have quietly gotten rid of landlines. Many of those telephone companies are dead today. Technology changed everything. New technologies such as lithium-ion batteries, LED lights and rooftop solar power are changing the way electricity is generated and supplied. When? It’s actually happening right now. In Australia, Germany and other parts of Europe, demand for electricity have shrunk in the last 5 years. Over a million Australian customers have solar panels on their roofs, and they are buying less and less electricity from the electrical companies. Prices have gone down much faster than expected, although we will keep on hearing that these technologies are expensive and not easily available. According to the International Energy Agency, electricity generation from rooftop solar panels is now cheaper than many of the old technologies. Check your local prices. 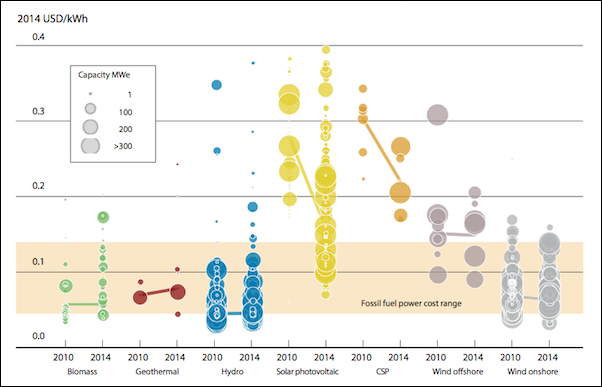 Levelized cost of electricity from utility-scale renewable technologies, 2010-2014. Source: IRENA Renewable Cost Database. Lithium-ion batteries are available right now in your laptops, phones and tablets. They last much longer than the old lead-acid batteries, and don’t pollute the environment. The bigger ones—for cars and homes—are slowly coming. Lithium-ion battery prices have gone down from about $2,000 per kWh to about $300-$400 per kWh right now. Today, for less than $1,000 many small households in ADB’s developing member countries can build a small electrical generation system: solar on the roof, lithium-ion batteries for storage, about 10 LED light bulbs, a fan, and a small TV. These battery-based systems will be in our homes very soon, especially after Tesla CEO Elon Musk last May unveiled Powerwall, a new type of affordable battery to store solar energy and serve as a back-up system for consumers during power outages. Powerwall’s 7kWh costs about $3,000, and the 10kWh unit $3,500. Why should you care? If you are a customer, this may finally give you the chance to take control of your own electricity needs away from utility monopolies. If you are an investor in these companies, you may want to rethink your portfolio. If you are an electricity company, you may want to follow the path of smart telephone companies of the 1990s and embrace change. Please remember, the days of high prices and fixed revenues are coming to an end. Some of the cables in our distribution and transmission lines will be soon sold as scrap metal for recycling, like we did with copper wire from our old landlines. So the next time you complain about your high electricity bill, think again. You have a choice. You can force these companies to change. They have no choice. New technology is already here.